Do you need to move your wedding guests from ceremony to reception and keep them basking in the breeze of the San Francisco Bay? Or get convention guests from the Moscone Center to an after-party? Are you treating a group to dinner and a movie, and you want to keep the party going in transit? Cabrio Taxi pedicabs are your best source for professional, reliable service with a smile. Pedicabs are so much more than an eco-friendly way to transport large and small groups between locations in San Francisco. Adding Cabrio Taxi’s pedicabs to your event will ensure that transportation becomes an integral component of the overall experience. 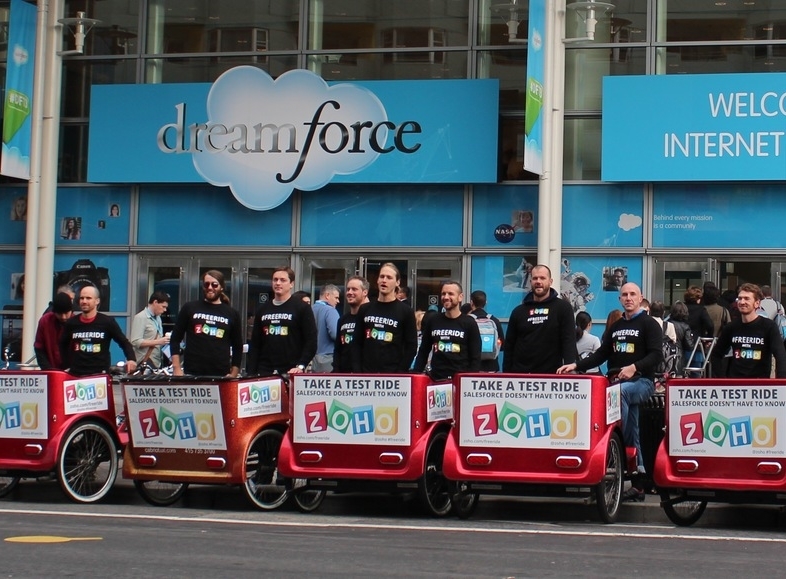 Pedicabs can even be incorporated into team building activities (e.g. treasure hunts and decorating competitions). Passengers often tell us that their pedicab ride was their favorite part of the event. While a lavish dinner, or educational forum will be appreciated, an open air ride through San Francisco, possibly taking in the breath taking views of the Bay Lights project on the Bay Bridge, is always a highlight that will be remembered by your guests and customers. Additionally, pedicabs generally operate in dedicated bicycle lanes throughout San Francisco. This ensures unexpected traffic delays, which are very common in the City, do not create scheduling challenges for the event coordinators. We’ll deliver an experience that your guests will be talking about long after your event winds down. Individualized pricing is available, as well as volume discounts where applicable. To wow your guests with Cabrio Taxi Pedicabs, contact us anytime. Can you tell us when you expect your campaign to begin? If possible, please provide us with any other details re: your campaign or project. Thanks for your inquiry about events with Cabrio Taxi Pedicabs. We will get back to you shortly. If you need to reach us immediately, give us a call at (415) 735-3700. Album: See how we class up events. 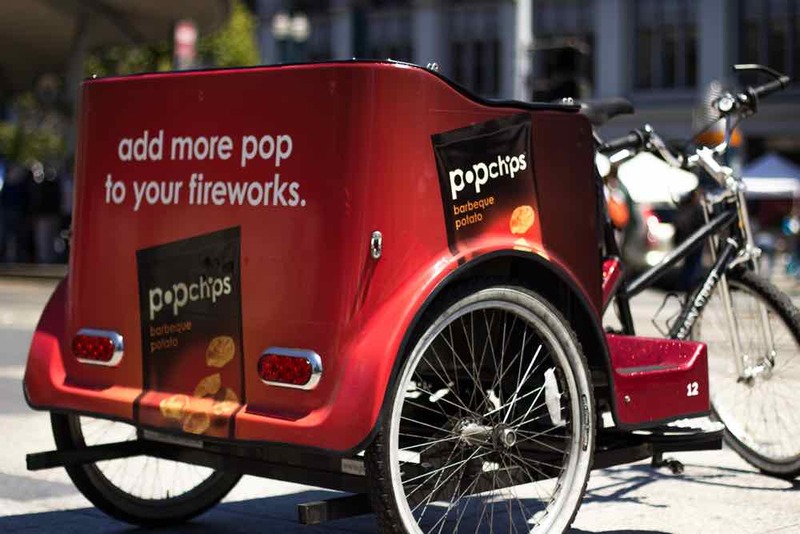 Full wraps are the largest pedicab advertising spaces possible. They cover the entire cab body including side panels, back panel and the calf area. This space permits you to have the most product and brand recognition. The wraps are produced on high quality outdoor waterproof vinyl. We provide you with a custom template which helps you design your artwork to maximum impact and work with you throughout all phases of production. Our pedicabs can provide 3 potential advertising panels virtually transforming the cab into a mobile marketing unit representing your campaign and company brand, value and messaging. This is a simple but effective branding solution. Looking to grab even more attention? 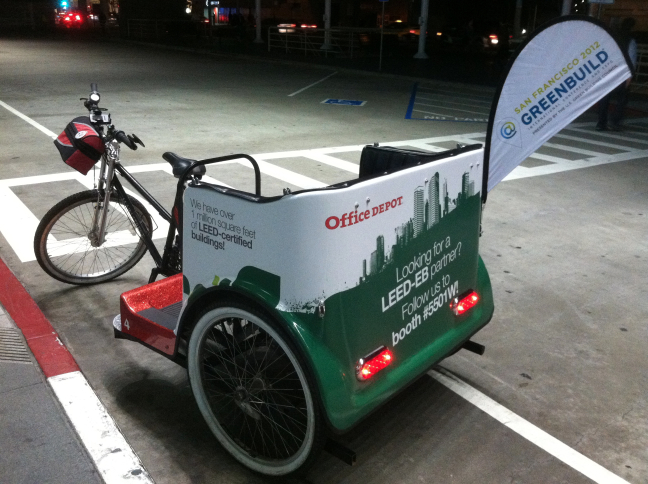 Adding one or two tear drop banners behind each pedicab ensures even more brand visibility during an advertising campaign. We're up for anything. Cabrio works with partners to develop custom solutions for many types of campaigns. Perhaps your compliments ours. This is a simple solution that highlights our beautiful pedicabs. 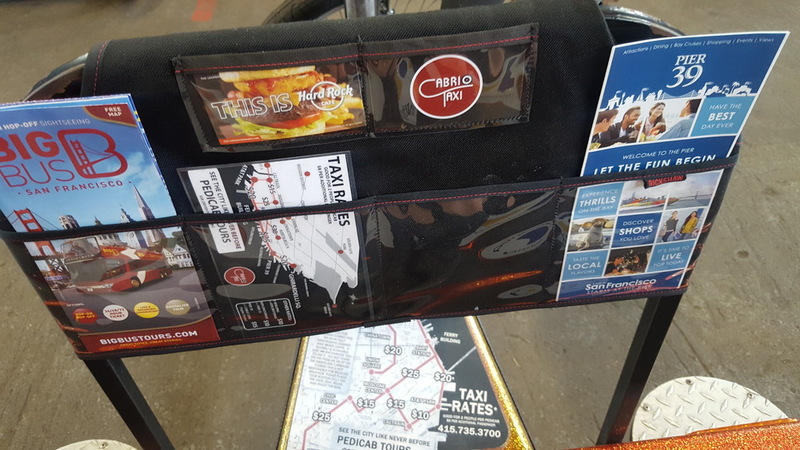 Put flyers in front of our passengers in our custom-made Rickshaw Bagworks bags! We used Cabrio for a corporate event in November and they were a big hit! The bikes are striking with their shiny red exterior and Geoff (owner) made custom banners with our client’s logo across the back. Our guests rode in style and felt like VIPs. All the riders were extremely nice, knowledgeable about the city and really love what they do. 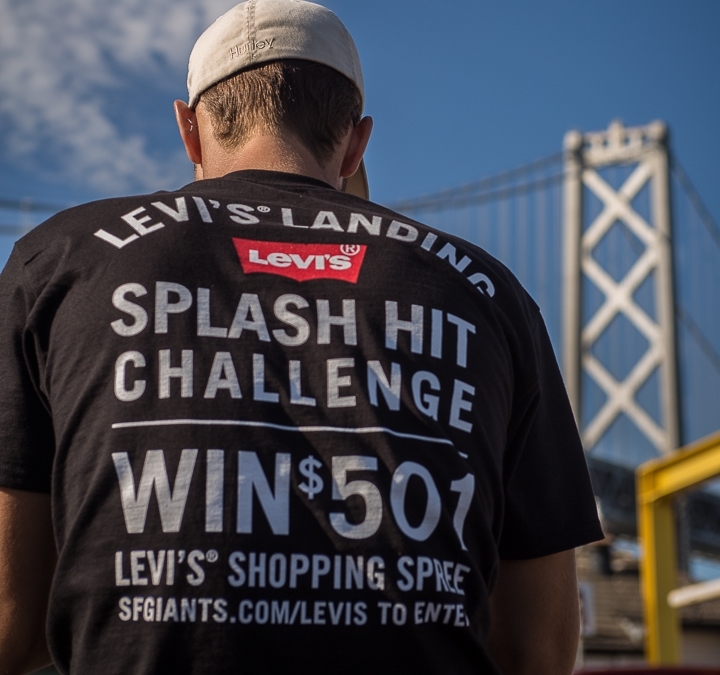 Help support this local San Francisco company.